Of all the horrors human beings perpetrate, genocide stands near the top of the list. Its toll is staggering: well over 100 million dead worldwide. Why Did They Kill? is one of the first anthropological attempts to analyze the origins of genocide. In it, Alexander Hinton focuses on the devastation that took place in Cambodia from April 1975 to January 1979 under the Khmer Rouge in order to explore why mass murder happens and what motivates perpetrators to kill. 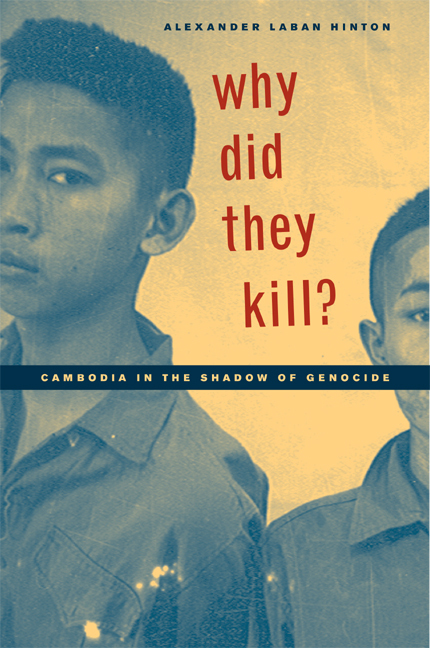 Basing his analysis on years of investigative work in Cambodia, Hinton finds parallels between the Khmer Rouge and the Nazi regimes. Policies in Cambodia resulted in the deaths of over 1.7 million of that country's 8 million inhabitants—almost a quarter of the population--who perished from starvation, overwork, illness, malnutrition, and execution. Hinton considers this violence in light of a number of dynamics, including the ways in which difference is manufactured, how identity and meaning are constructed, and how emotionally resonant forms of cultural knowledge are incorporated into genocidal ideologies. Alexander Laban Hinton is Associate Professor of Anthropology at Rutgers University, Newark. He is the editor of Annihilating Difference: The Anthropology of Genocide (California, 2002), Genocide: An Anthropological Reader (2002), and Biocultural Approaches to the Emotions (1999).